Polyvinyl Butyral (PVB) Market size was over USD 2.3 billion in 2016 and will grow at a CAGR over 5.5% over the projected period. Strong growth in the automotive industry primarily in Asia Pacific and Europe will subsequently have a positive impact on the polyvinyl butyral market size in the forecast span. This increase is mainly attributed to its extensive applications in manufacturing laminated safety glasses like windshields and soundproof glasses. These products possess superior properties which include high strength, impact resistance ability, better security, toughness and high clearness which makes it highly preferable in the transportation industry. Furthermore, the product is also used in automotive windows to improve the overall safety and reduce external noise. Additionally, these products can absorb harmful infrared radiation from the sun which significantly enhances vehicles protection. Currently, the numbers of cars equipped with safety glass side windows are small owing to its high price. However, shifting consumer preference towards security features in automobiles, coupled with rising innovations to reduce the product prices will make a noteworthy contribution to polyvinyl butyral market size during the entire projected period. Rising polyvinyl butyral demand from building & construction industry primarily in Asia Pacific, Latin America, Europe, and the Middle East will help attain promising gains to polyvinyl butyral market size in the upcoming years. For instance, the construction industry in the region is anticipated to grow at a CAGR close to 7% over the entire projected timeframe. The product is extensively used in commercial & industrial facades, balustrades, overhead glazing, floors & stairs, and so forth owing to its value adding features including improving aesthetic value, reducing sound transmission, and reduction of UV rays’ transmission. Increasing product use in government offices, stadiums, airport terminals, museums, shopping malls, and defense offices will drive the product demand which will further help in attaining substantial gains to PVB market size over the next years. Availability of product substitutes in the market such as PVA is likely to hinder the overall polyvinyl butyral market size during the entire forecast time. Moreover, high product recycling activities in the developing economies of APAC like China will also show a significant effect on the growth of global polyvinyl butyral market over the forecasted years. Polyvinyl butyral market size for lamination achieved the highest market share and will grow at a higher CAGR in the entire projected period. The growing demand for laminating glass in automobiles and construction industry is determined to boost the product demand in developing regions of APAC, and Europe. Acoustic protection held the second dominant market share till 2016, and this segment will further show its dominance over other applications in the entire forecast period. Increasing demand for acoustic protection in places such as hospitals, airports, and government offices will likely boost the polyvinyl butyral demand for acoustic protection soon. In 2016, polyvinyl butyral market for building & construction accounted for the most significant share followed by transportation, and defense end-user industries. 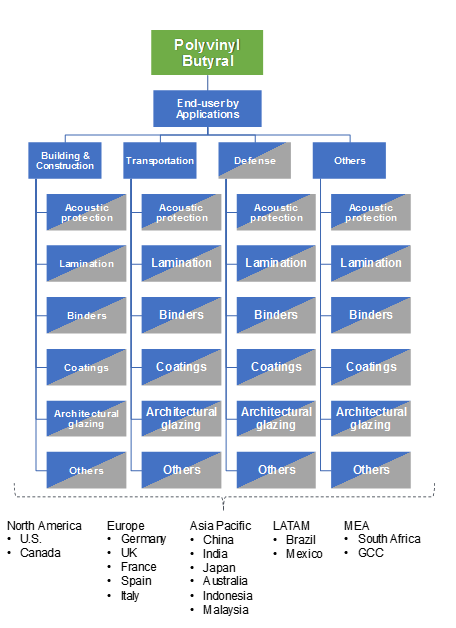 Increasing product demand for lamination and acoustic protection applications in the building & construction industry will majorly account for the most significant market share by the end of 2016. Further, the need for PVB resins in coatings and binders in the construction industry is also increasing, which will further boost the global polyvinyl butyral market over the coming years. Polyvinyl butyral market size for transportation held the second dominant share which was valued more than USD 630 million by the end of 2016. Due to consistent advancements in the industry which has been substituting conventional vehicle glasses with laminated polyvinyl butyral glasses. For instance, most of the products are used in producing automobile laminating glasses which can provide high strength. Also, using polyvinyl butyral in vehicle glass, the transmission of external sound into the vehicle can also be reduced, which will further help in achieving significant gains in polyvinyl butyral market size for transportation over the projected period. Polyvinyl butyral market size for defense industry will grow at a CAGR over 4.5% over the coming years. The product is widely used in defense end-user applications as a protection against attacks due to its excellent high-strength property. Geographically, Asia Pacific polyvinyl butyral market size is determined to have the highest market size by 2024. This is primarily due to growing polyvinyl butyral demand across numerous end-user industries including transportation, defense, building & construction industries in this region. Europe polyvinyl butyral market size was more than USD 500 million by end of 2016. This is highly attributed to the consistent growth of construction activities in this region. 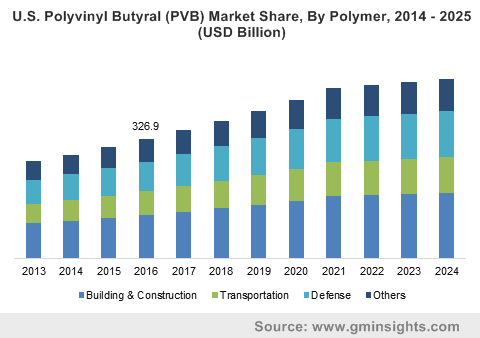 Further, high rise in the automobile production in countries like Germany will boost the overall demand for Europe polyvinyl butyral market by the end of 2024. Major polyvinyl butyral market size players are Kuraray Co., Ltd., Eastman Chemical Company and Sekisui Chemical Co., Ltd. Other players operating in the polyvinyl butyral market are Kingboard (Fo Gang) Specialty Resins Co Ltd, Huakai Plastic, Zhejiang Bisheng Plastics Co., Ltd., and Chang Chun Petrochemicals Co., Ltd.
Key polyvinyl butyral market share contributors are engaged in expanding their production capacities to meet the rising product demand among consumers. For instance, Eastman Chemical Company completed the Saflex Q series advanced acoustic PVB extrusion line in Belgium. This new facility produces multi-layer rolls of Saflex Q series sheet for automotive applications. Polyvinyl butyral is a polymer material which is majorly used in making laminated glass structures. Their primary application is in building & construction and transportation sector. Laminated glass is used across end-user industries as a protective layer. Usually, polyvinyl butyral is fused between two panels of glass for safety against breakages. The major companies in this market are expected to have a noteworthy market share in the coming years. New companies entering and targeting present players will help the polyvinyl butyral manufacturers to overcome the effects of volatile economy, leading to expanded business range and revenue growth.